Second Arrest Made in Scenic Loop Murder, FORT WORTH, March 17, 2017 - Polk County Sheriff Kenneth Hammack reports that detectives have made an additional arrest in the murder of Darrell Parsons. On march 15, 2017, an arrest warrant for the charge of aggravated assault causing serious bodily injury was obtained from Justice of the Peace, Jamie Jones with a preset $100,000 bond for the arrest of Angela Marie Hicks, a neighbor that resided next door to the location of the murder. Information obtained in the criminal investigation by detectives was presented to the Polk County District Attorney’s Office. Hicks was arrested in Fort Worth on march 16th after requesting the assistance of Fort Worth Police Detectives. Hicks will be transported to Polk County Jail at a later date. Detectives interviewed Hicks who stated that she requested Simon Villanueva to take care of Darrell Parsons and to make him hurt like she hurt. Sheriff Hammack stated that his detectives are currently following up on leads and request anyone who feels they have information to assist in the investigation to contact Lieutenant Craig Finegan with the Criminal Investigation Division at 936-329-9028. Murder In Senic Loop, LIVINGSTON, March 13, 2017 - On March 6, 2007, Sheriff Kenneth Hammack advised the Polk County Sheriff’s Office took a missing persons complaint involving a Darrell Parsons. The complainant advised Parsons had not been seen or heard from since February 28, 2017, at which time he was wearing a red T-shirt, blue jeans and a camo jacket. Sheriff Hammack said Parsons was last seen in the Shelter Cove area of Livingston. According to Sheriff Hammack, on March 8, 2017, the Sheriff’s Office, Criminal Investigative Division conducted follow up interviews into the disappearance of Darnell Parsons at a residence located in the 400 block of W. Sherwood, which is located in the Shelter Cove subdivision. Sheriff Hammack, said his Detectives were told Mr. Parsons had been recently living off and on at 440 W. Sherwood but the occupants had recently moved out. When detectives arrived at the residence (44 W. Sherwood), they encountered a strong putrid odor emitting from the residence. Detectives gained entry into the residence after being unable to get an answer at the door. The detectives (with the Polk County Sheriff’s Office) said that they found inside the residence an unidentified deceased male inside the home. The detectives transported the victim to the Harris County Institute of Forensic Sciences to be identified and to possibly establish the cause of death. The Polk County Sheriff’s Office’s Investigative Division, began interviewing subjects in the neighborhood, and found the previous tenant was one Simon Villanueva. Detectives discovered Villanueva had left the Livingston area days before the unidentified body was discovered in his residence. Texas Ranger Danny Young from Company A, division of the Texas Rangers joined the investigation assisting with evidence gathering and interviewing individuals from the Shelter Cove area. Polk County Sheriff's Detectives petitioned the courts and obtained a warrant for Simon Villanueva, for Possession of a Controlled Substance with a 100,000.00 bond, at which time the Gulf Coast Violent Offenders Task Force begin Looking for Simon Villanueva. Sheriff Hammack, advised on March 9, 2017, the Polk County Sheriff’s Office was informed the body found at 440 W. Sherwood, was that of our missing person Darnell Parsons, and his cause of death was being ruled a homicide. On March 10, 2017, Simon Villanueva, called the Polk County Sheriff’s Office, and advised he was at the Scenic Loop store waiting on Deputies, because he heard that they were looking for him. Detectives located Simon Villanueva, and transported him to the Polk County Sheriff’s Office. Detectives with the Polk County Sheriff’s Office interviewed Simon Villanueva, concerning the death of Darnell Parsons. On March 10, 2017, Simon Villanueva was arrested for Murder after confessing to Polk County Sheriff’s Office Detectives to killing Darnell Parsons. 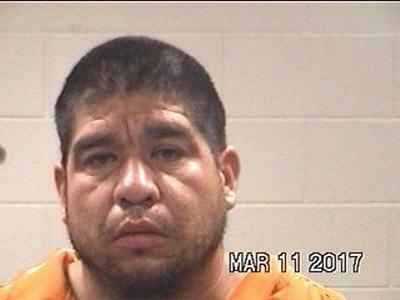 Simon Villanueva, was placed in the Polk County Jail under a 500,000.00, bond that was set by Justice of Peace Pct. # 4 Judge Jaimie Jones.